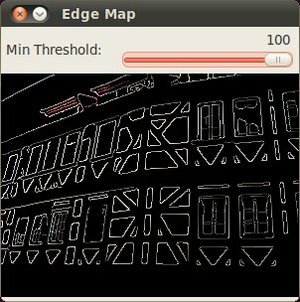 Use the OpenCV function cv::Canny to implement the Canny Edge Detector. Low error rate: Meaning a good detection of only existent edges. Good localization: The distance between edge pixels detected and real edge pixels have to be minimized. Minimal response: Only one detector response per edge. Non-maximum suppression is applied. This removes pixels that are not considered to be part of an edge. Hence, only thin lines (candidate edges) will remain. Canny recommended a upper:lower ratio between 2:1 and 3:1. For more details, you can always consult your favorite Computer Vision book. Asks the user to enter a numerical value to set the lower threshold for our Canny Edge Detector (by means of a Trackbar). Applies the Canny Detector and generates a mask (bright lines representing the edges on a black background). Applies the mask obtained on the original image and display it in a window. We establish a ratio of lower:upper threshold of 3:1 (with the variable ratio). We set the kernel size of \(3\) (for the Sobel operations to be performed internally by the Canny function). We set a maximum value for the lower Threshold of \(100\). Each time the Trackbar registers an action, the callback function CannyThreshold will be invoked. We fill a dst image with zeros (meaning the image is completely black). Finally, we will use the function cv::Mat::copyTo to map only the areas of the image that are identified as edges (on a black background). cv::Mat::copyTo copy the src image onto dst. However, it will only copy the pixels in the locations where they have non-zero values. Since the output of the Canny detector is the edge contours on a black background, the resulting dst will be black in all the area but the detected edges. Notice how the image is superposed to the black background on the edge regions.